What's the tastiest candy? What's the best horror series, Friday the 13th or Nightmare on Elm Street? Is your 19-year-old brother a little too old to be going door-to-door for candy? For all the arguments we can get in over Halloween, we have confidence that we all can agree on one simple fact: one of the scariest things that can happen on the holiday remains sudden movement by a Spooky Thing. Right? Right. 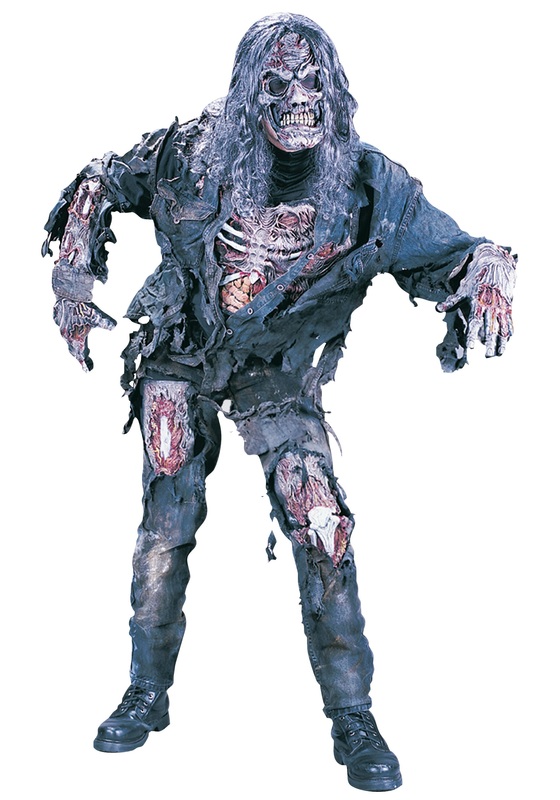 Well, if you slip into this teen zombie costume, you'll be instantly qualified to scare the jeepers out of anyone! Jump-scaring your sister and slow-turning toward some trick-or-treaters has never been so terrifying (for them) and amusing (for you)! This zombie has been lurking underground for some time, but he's since resurrected through your lawn—and his stomach is empty and grumbling! It's a one-piece nightmare for anyone antsy to conveniently post up on the lawn or in your local haunted house waiting to scare the senses out of anyone foolish enough to get close. The details make all the difference, with detailed flesh and bone foam pads throughout the costume, a tattered blue and gray cotton shirt with a foam chest plate, and silver hair attached to the mask all will make your Halloween look realistic and gruesome. You might scare off some strangers, but you can make friends the day after, right?